You would think trying to explain the history of a league that is only entering its 12th season would not be difficult. You would be wrong. Perhaps the simplest way to comprehend just how deep and complex the history of Australia’s A-League is through the literature produced on it. If you’re interested in the details, pick up a 2015 book entitled ‘A-League: The Inside Story of the Tumultuous First Decade’. That’s right, 309 pages about the tumultuous first decade alone. We’ll try to keep things a bit shorter. First, to understand the A-League, you have to understand the environment it operates in and the league that preceded it. Australia is a sports-mad country and, consequently, football competes in a jam-packed market. There are already three football codes: Australian Rules football, rugby league and rugby union – all of which have storied histories stretching back over a century – as well as cricket, the national sport. Football is seen as a more recent introduction to the Australian sporting landscape. It is often viewed as a foreign, ‘soft’ sport; an other. The rise in immigration from European countries after the Second World War prompted the creation of ethnically-linked football clubs all over the country – from the Italian-backed Adelaide City to Melbourne Knights, a Croatian team, on to Sydney Olympic founded by Greek immigrants, these teams popped up everywhere. These clubs provided these people with a little slice of home and a chance to share and retain their culture, language and, in a way, a sense of normality, in this strange place halfway across the world. From these clubs – and the success of the 1974 Socceroos who made it to the World Cup for the very first time that year, gaining the admiration and respect of those at home and abroad – came the National Soccer League (NSL) in 1977. This makes no mention of the state of disarray the sport’s governing body was in – in a financial sense and an administrative sense – but ultimately the NSL ended at the conclusion of the 2003-04 season. Football in Australia needed a saviour. Billionaire Frank Lowy was courted for some time before agreeing to step in and become chairman of the governing body in July 2003. Football was in such a sorry state that it was, essentially, at the mercy of Lowy. The government had commissioned an independent review into the corruption and mismanagement of the sport’s governing body and made a list of recommendations not only for the new governing body but also the new league. However, such was Lowy’s power that he was able to ignore certain suggestions concerning both the new national competition and the new governing body and do whatever he thought was best. The A-League began in 2005-06, with seven teams from Australia and one from New Zealand. It would be played over summer to minimise the competition from the other football codes, which are all traditionally winter sports. The league was, and still is, closed, meaning no promotion and relegation. Its salary cap is meant to serve as an equalisation strategy. The league is not separate from the governing body and the clubs can be considered franchises. Its champions are decided via a finals series, where they win a trophy that resembles a very expensive and fancy toilet seat (we mean this affectionately, trust me). The competition did well in its first few seasons and has had its ups and downs since. Seven of the eight original teams have made it to the 12th season, and the league has also lost two of the expansion teams it picked up along the way. The New Zealand Knights are defunct, as are North Queensland Fury and Gold Coast United, both of whom entered the league in 2009-10 and both of whom folded after the 2010-11 season; the former because of financial reasons, the latter can blame their owner. The league currently sits at 10 teams – nine Australian-based and one from New Zealand. Here’s a quick guide to the clubs. A former coach once called Adelaide “a piss-ant town” (I still don’t fully know what this means but it was not meant affectionately). Brazilian star Romario played four games for the club. The coach described him as “a season killer” and “a waste of money”. The league’s glamour club for all intents and purposes. Won the very first Championship with the help of former-Manchester United striker Dwight Yorke. Alessandro Del Piero played for them as well, making black and white the dominant colours at matches rather than sky blue. Unofficial anthem is “Stand by Me” by Ben E. King. It’s magic to listen to the whole stadium sing it. The youngest club in the league has already made the grand final three times. And lost every one. Won the Asian Champions League which is a pretty big deal. Their fans are incredible and they invented the Poznan (I’m kidding). Used to train on land they borrowed from a university. They’ve since bought the land and developed it into a $15 million football academy. 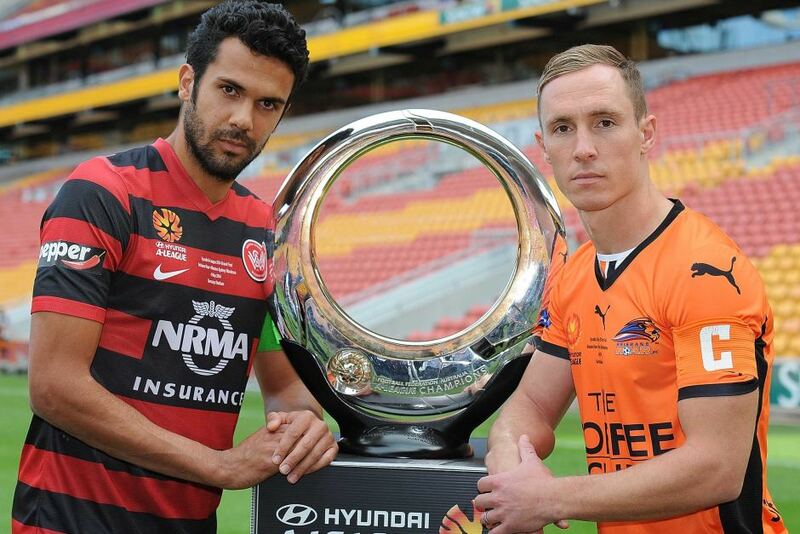 Played in the NSL and successfully made it over to the A-League. They were, in essence, the blueprint for all other A-League clubs. Has the creepiest mascot in the league. This year they celebrate their 20th anniversary. A smaller club that has won a championship. Ownership issues always seems to be just around the corner for the club. Signed Mario Jardel for a season. He played 11 times. The club’s owner wanted him to play more; the coach wanted to keep him to making appearances off the bench. They have giant, inflatable sauce bottles at their home ground, two pirate mascots and a brass band. The dominant team of the early part of this decade. They won three of four championships between the 2010-11 season and the 2013-14 season and during that time went on a streak of 36 games unbeaten. From Miron Bleiberg, described as the A-League’s Jose Mourinho, to Ange Postecoglou, the Pep Guardiola in this metaphor and current Socceroos boss, this club has had quite the mix of coaches. The only professional football club in New Zealand playing in what is an Australian league. This has posed some problems, with the very existence of the club in the league coming under threat last year. Their fans takes their shirts off in the 80th minute if the team is winning. In among all that craziness is the actual football. Year after year, the quality of the play has improved. There are characters in this league and genuine superstars. Melbourne City’s Bruno Fornaroli set the league on fire last season, scoring a record 25 goals in a season. He’ll be joined at City by Tim Cahill, our most well-known Socceroo, in a move which is expected to give the league a much needed boost. Besart Berisha made his name in the league at Brisbane Roar but now plays at Victory and is one of the most divisive characters in the league; if he’s not on your team, you probably hate him. And, of course, there’s young Australian talent everywhere, from Jamie Maclaren at Brisbane Roar to Adam Taggart at Perth and Bernie Ibini at Sydney FC. So as the action kicks off for another season, so does all the drama, all the football and another entire book’s worth of stories. Tune in starting October 7 – and I, for one, can’t wait.